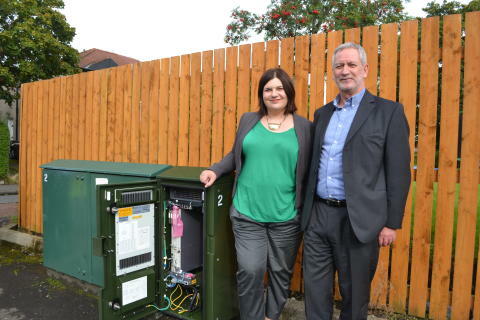 Susan Aitken, leader of Glasgow City Council with David Nixon, senior fibre deployment manager, Openreach. The new ultrafast services have already started to go live in more than 9,000 thousand homes and businesses in parts of Langside, Linn and Rutherglen and, as part of a visit to Langside telephone exchange, Ms Aitken met with a number of engineers who are building the new broadband infrastructure in the city. Parts of the city centre and Bridgeton in the east end will also benefit later in the year as part of a UK pilot of cutting edge G.fast technology. Openreach plans a national rollout of ultrafast broadband to 12 million homes and businesses by 2020. Download speeds of up to 330 megabits per second (Mbps) – about ten times the UK average – will be available to thousands of homes and businesses in the pilot areas. People using it will be able to download a two hour HD film in just 90 seconds, a 45 minute HD TV show in just 16 seconds, and a nine hour audio book in just three seconds. The new technology allows ultrafast speeds, which previously required fibre optic cables to be run all the way to a property (FTTP), to be transmitted over existing copper lines and fibre broadband cabinets. This is significant as G.fast will enable Openreach to make ultrafast fibre available more quickly to a much larger number of homes and businesses than if it focused on FTTP alone. It adds to the significant work already completed in Scotland, where Openreach has made fibre broadband, with speeds up to 80Mbps, available to around 2.2 million premises through a combination of the company’s investment and the Digital Scotland partnership with the public sector. G.fast is a cutting edge technology which allows us to deliver Ultrafast speeds over existing copper lines. It builds on our existing network, so it allows us to upgrade areas very quickly with minimal disruption and cost, and will evolve over time to offer even faster speeds.